A river carves its twisting way through the landscape, a sloping mountain is made gentle by time, oxygen turns the rusting shell of a car into red dust, an ocean of tea is drunk daily over the course of a lifetime; nothing exists without tiny, incremental, unrelenting repetition. Monotony is a requirement for creation/destruction. Our days are composed of the same gestures and actions, repeated in sequence and changing imperceptibly over time, either deliberately or unconsciously. Once accumulated, habits hold the shape of a life, just as cells hold the shape of a plant. A crochet hook or hand-sewing needle repeats its motion hundreds of times with particular variations, manifesting individual shapes and pattern. 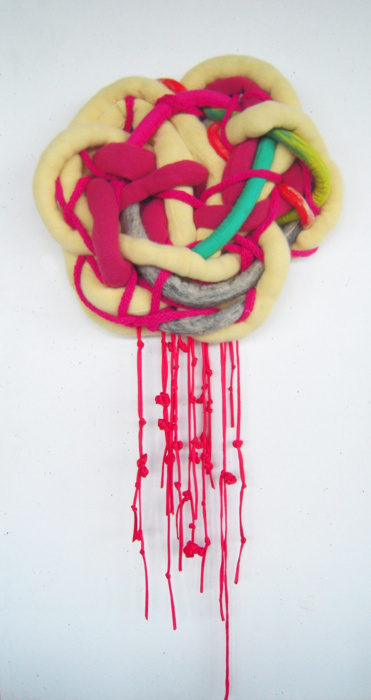 This installation is a visual exploration of links between cellular biology, organic growth and decay through the particularly suited medium of textiles. As a case in point, the sum of the body of work is in itself the product of a sustained, repetitive daily practice. Mimi Stockland is a multidisciplinary visual artist and performer based in St. John’s, Newfoundland. She obtained a BFA in Painting and Drawing from Concordia University in 2009. Mimi relocated from Montreal to Newfoundland in 2015 after obtaining a diploma in Textile Construction from the Cégep du Vieux-Montréal, where she specialized in digitally-assisted machine-knitting. In addition to working in fibers, her practice extends to illustration, printmaking, performance and video. Her work is held in private collections across Canada and she has performed on stages in Canada and Europe.